Henrys Bay House Restaurant is nestled in the West Coast town of Stranraer. The menu features locally sourced fish and meat prepared and cooked freshly to order by local chef/restauranteur John Henry. 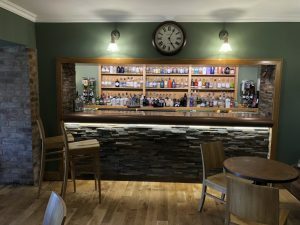 The restaurant also boasts the finest sun terrace in the area for alfresco dining and views overlooking the picturesque Loch Ryan where you can watch the ferries going to and from Northern Ireland and Cairnryan Port. The comfortable and stylish restaurant and bar are managed by his wife Jane and her team of attentive, welcoming staff. 5pm – 6pm, Tuesday – Friday! For details of their extensive menu and for full details, please see their website. At the Masonic Arms we offer a wide range of draught beer, wines, spirits and not to mention over 260 gins! With a great emphasis on Scottish gin. We have a passion for serving quality gin and tonic, all our gins are served in a large “Coppa” style balloon glass, filled with ice and served with a variety of fresh garnishes and whichever tonic compliments the selected gin. You may not be a gin drinker but you may leave simply converted! Scottish License Trade News Gin bar of the year finalist 2018. Comprising of two bars the traditional public bar at the front, followed by a comfortable lounge bar at the back. There is even a beer garden at the back of the building making sure the smokers are comfortable too. We offer a pool table and all the traditional pub games of dominoes, cribbage and chess – all you need to do is ask! The Masonic arms is currently listed in CAMRA’s Good Beer Guide which is also a good way of planning a trip to the area too. Clashwhannon Caravan Park and Public House is a small friendly family run business. Our resident Chef and his team are on-hand to provide you with some amazing food. We strive to use as many locally sourced Scottish ingredients wherever possible. We guarantee you will love our menu at The Townhead Hotel. We also cater for dietary requirements, such as Gluten Free & Vegetarian, so please do not hesitate to ask one of our staff who will be happy to help. Welcome to The Steam Packet Inn & Hotel on the beautiful Isle of Whithorn in Dumfries and Galloway. Along with great food & drink, you can be sure of a warm welcome at this family run pub & restaurant. A lovely traditional, real pub situated right by the station in Lockerbie. Great beer, superb coffee and excellent banter.